I am breaking out of my schedule because I could not wait one moment longer to tell you about this book. In this French picture book, a little girl walks through the beauties of the seasons, accompanied by simple text and smooth, modernistic art. When I took this book out of the review box and dived in, it made me desperately hungry for summer. I could smell and taste it that very moment. I simply had to share it, so I decided to read it at Tiny Tots, our evening storytime. I don't normally do this storytime, but Miss Pattie had to be at a school board meeting (our town may be getting a 4k program next year) and I stepped in. Tiny Tots is all ages, whoever shows up. This evening, one baby, 2 18month olds, and 5 3-ish kids showed up (that was the Most Attentive Baby Ever, btw). We talked a little about what season it was - we agreed it wasn't summer yet, and winter was over because the snow was mostly gone, so it must be spring. Then I opened Seasons and read the first sentences: "Everything is green. It must be springtime. And springtime smells beautiful." A hush fell over the room. We read every sentence. We talked about the tomatoes and cherries (the kids were sure they were apples). We found the ladybug. We talked about fog. Everyone heaved a very satisfied sigh when we had finished. 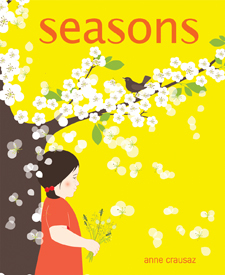 The simple text and illustrations are deeply evocative of the joys of the changing seasons. The book circles from spring to summer to autumn to winter and back to spring, making it a perfect story for any season. This book is gorgeous and perfect. I really wanted to like this book. I liked Up and Down the Scratchy Mountains and Baxter the pig who wanted to be kosher. I really, really loved Any Which Wall. I even asked for a review copy of Penny, which I almost never do. Penelope Grey is bored. She doesn't want to tell anyone because...well, she doesn't want to be a spoiled rich girl and she knows she has so much she shouldn't be bored but...she is. She has no friends, her parents work or socialize constantly, and she doesn't go to school, but has a tutor. So one day she puts a wish in the wishing well in the garden...and her dad quits his job. At first, Penelope thinks this might be, at least interesting, if not exactly what she was hoping for. But everything goes wrong. Pretty soon there's no money, no servants, her parents aren't talking to each other, and Penelope knows it's all her fault. Maybe another wish can set things right? Suddenly, the whole family is moving to the country, to the tiny town of Thrush Junction where her mother has inherited a house...and, it turns out, a large group of rent-free tenants, not to mention some rather sizable debts incurred by rare llamas. Penelope gets a new name - Penny - a new friend, Luella, and a whole new world to explore. Will they be able to stay? Will Penny find the treasure? Will she make more friends? The problem for me with this story was A. the characters never felt real and B. not enough happened. "Penelope's" life as a poor little rich girl felt exaggerated and unrealistic. She doesn't seem to ever leave the house, except for a few outings with a couple other girls (who I thought were nannies, until one of them is mentioned as having a sleepover). Why does Penelope have a tutor? Why doesn't she go to a private school? Her parents' sudden and complete helplessness in the face of money and practical issues felt wrong; how did her father run a company (however incompetently) without even the faintest idea of money? How does her family go from wealthy to complete poverty in only a couple weeks? Her mother throughout the book shows that she's had a capable and independent past, yet she seems to completely lose any practical abilities in the face of disaster. 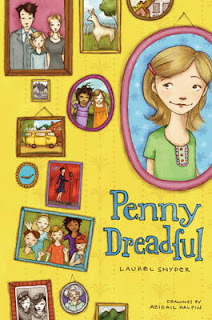 Once we meet "Penny" I started getting drawn into the story. She felt more realistic and her struggles to fit in with kids who had very different backgrounds sounded real. However, I still kept waiting for something to happen. Money problems get worse, Penny and Luella hang about and meet some other kids, and then the treasure hunting expedition is crammed into the last few chapters. I wanted...more concrete action? Fewer side characters and more focus on the main characters, since I never felt like I got a really good handle on them, especially Luella. Reading as an adult, and having grown up in and out of small towns, the happy happy feeling in Thrush Junction didn't work for me. The small towns I knew and lived in weren't...well, they weren't that happy. And there was a lot more alcohol around. And the acceptance of eccentrics...I guess maybe Ms. Snyder has had much better small town experiences than I have, that's all I can say. So, those are the things that didn't work for me, the adult librarian reader. What about the intended audience, children? I don't honestly think this would have worked for me as an 8-12 year old either. I never did like eccentric characters and while I really liked small town adventure stories, I would have wanted more adventure, maybe some sneaking around at night at least, and a lot more funny bits. However, I do think there is an audience for this story. It's a good peaceful reading-in-the-summer-sun story. Kids who DO like eccentric characters with just a little hint of mystery will enjoy this story. Kids who want to fantasize about what it would be like to move to the country, who like stories about friendship and family, they will all enjoy this story. 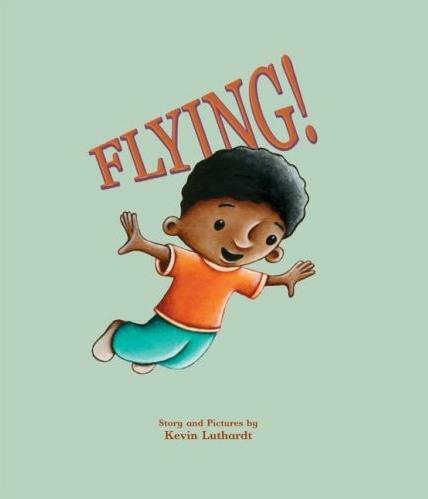 Verdict: This story didn't work for me and I would probably have trouble booktalking it, but I'm still glad I purchased it for my library and it has circulated several times already. Probably those who like When You Reach Me (which didn't work for me either) would enjoy this one and it's a good summer reading story. Recommended for a core juvenile library collection. GIVEAWAY: Because I am sure this story is a good story - just not the right story for me - I am giving away the lovely hardback review copy Ms. Snyder was kind enough to send me. Post a comment with your favorite summer reading memory and I'll pick a lucky winner April 25. However. I believe some standards need to be maintained. Namely, BATHING. If I can smell you six feet away, if your hair is molded into interested shapes, if your clothes are moving on their own...something is WRONG. I realize how exhausting it is to raise kids (I know you have several kids, because I can see - and hear and smell - them in the children's area while you sit at the computer). I assume you live close by and it hardly seems worth the bother to get yourself and your children dressed if you're just walking over here. Pajamas we can overlook. Now I have to go bathe again because I can STILL SMELL YOU although I am at home. You are probably sick of hearing me complaining about nonfiction. Too expensive! Binding not worth what's inside! Won't actually interest kids! So we are going to take a little break from the down-down-down and look at some books from the librarian's friend, Bearport Publishing. I discovered Bearport about two years ago and now every January, when I order my series, I spend large amounts of time drooling over their sparkling catalogs. So far, I have added to my library series on snakes, spiders, scary places, big machines, and cats. EVERY SINGLE ONE has been popular. In fact, someone even stole one of the snake books! Library bound nonfiction doesn't often get stolen, in my experience. So, I was very excited when Bearport offered me a selection from their new spring series to review. The first sample we're looking at here is from the new Fast Rides series. 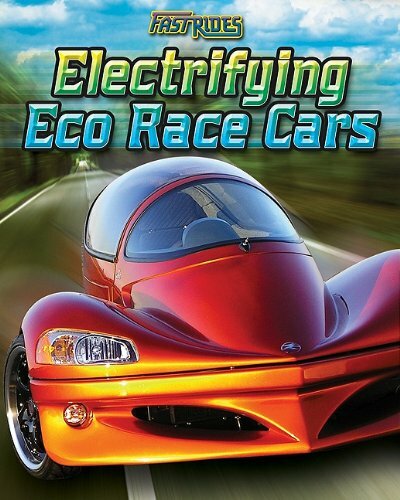 Electrifying Eco-Race Cars has all the hallmarks of a great Bearport series - great photographs and eye-catching illustrations, a unique topic that relates to a high-interest nonfiction topic, and smoothly written text that's accessible to a variety of ages and reading levels. Instead of looking at the popular but generic topic of cars and race cars, or the much-purchased-but-the-kids-could-care-less topic of alternative forms of energy, Sandler combines the two and showcases an exciting range of race cars with alternative fuel sources, including wind, electricity, solar power, and chocolate! Interesting tidbits of information are sprinkled throughout, along with speed stats for the vehicles and information about the races they have run, won, or might someday participate in. More difficult vocabulary words are bolded and included in a glossary in the back as well as a brief bibliography of further reading and links to more information at the publisher's website. This book is an introduction to the topic, not an exhaustive discourse, so it doesn't address some of the issues like safety concerns - are those super light cars more susceptible to crashes? or the cost of manufacturing them. Kids who get hooked on the topic will be back for more information! Verdict: When you're ready to update your racing section, this is the hands-down, top choice! 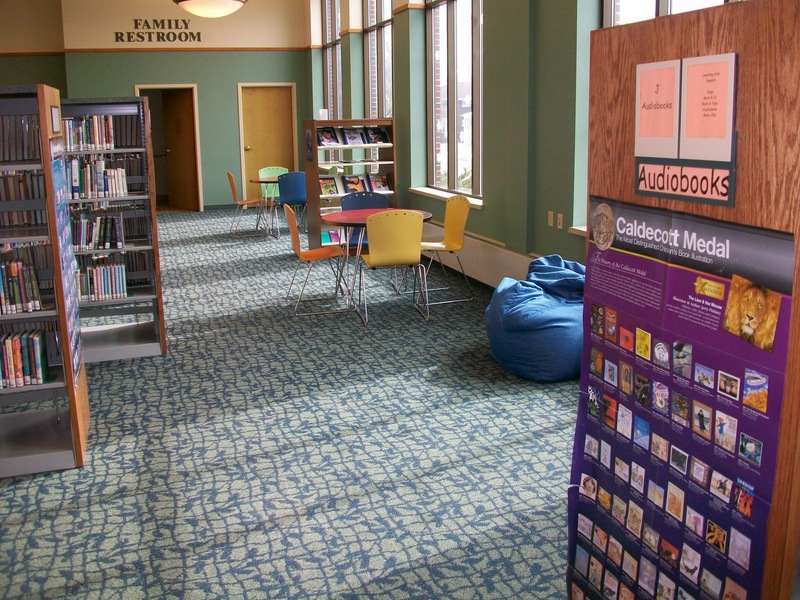 Another reason why librarians should -and do- love Bearport is their library-bound nonfiction isn't just popular with the kids, it's affordable. With discounts, buying through your vendor or the publisher direct, each volume usually only costs about $15 which is a definitely reasonable amount for books that will receive a lot of use and are strongly bound. ISBN: 9781617721373; Published April 2011 by Bearport; Review copy received from publisher. This week at the library; or, snow AGAIN?? I am totally blaming the weather on our head of circulation. It was getting nice and warm - nearly to the 60s! and she HAD to go and say "I bet we're going to have one more snowfall." All on you Gail, all on you. I knew intellectually that there was no school, but I hadn't really internalized it, so the resultant flood of kids and parents caught me off guard. I interviewed our summer intern (well, not interviewed, it was more of a "see how cool we are! please come work for us!" because I really need help this summer and I was very impressed with her and Really Wanted her to come here! And she is coming! Yay Abby!) We made flip books courtesy of Abby the Librarian. The link she had for a person shape wasn't working, so I just traced my giant gingerbread die cut with permanent marker onto cardstock and photocopied that. The kids loved it and the only glitch was when I sliced a little too deep with the papercutter and cut the head off one girl's creation! But we taped it and it was OK. It rained and our Wii is still being repaired. And it rained. And rained. It snowed and iced, but we didn't care! We had nearly 50 kids for Lego Club and one of our patrons donated a practically new Wii console and some more games! Yayyyy!! Nearly broke my neck coming down the icy stairs and my dang car doors froze shut again, but we have a Wii! Nice group for preschool storytime despite the chilly weather, happily most of the ice and snow was melted off by storytime. Our theme was chickens and we read Chicken Big, Fox and the Hen, and Chickens to the Rescue and made feathery round chickens with paper plates and feathers and orange triangles. Afterwards, we had box play! My new beanbags for the tween area came, so we had giant boxes and lots of fun decorating and climbing in and out. Pattie had a family emergency, so I was going to step in and do toddler storytime...and then I thought, well, why not? and asked our reference associate, Linda, to give it a shot. She has only had time to watch one lapsit program, but she turned out to be a natural and did a great job with an impromptu farm storytime, despite having FIFTY PEOPLE after I told her the average is 35. One poor mom was sick afterwards - combination of heat from the FIFTY PEOPLE and some other medical problems - but her boys are sweeties so I hung out with them until they all got picked up. I also zipped over to Game Stop and got us wireless sensors so we won't have any more Wii accidents and some more games to play and circulate while we're at it. Phew! It was a long week and I am soooo ready for spring! Toon Books branches out with a nonfiction easy reader comic! Zig and Wikki are on their way to Grandma's house...across the galaxy! A wrong turn lands them on earth, but that's ok. Zig has to turn in a pet for homework and what better place to find one than a strange planet? As they look for an animal that would make a good pet - i.e., one that won't eat them! - they explore a simple pond life cycle, fly, dragonfly, frog, raccoon. This is another great offering from Toon. Lively, colorful pictures with underlying earth tones contrast the environment of a pond with the alien Zig and Wikki. A funny narrative with plenty of nonfiction facts and a sly bit of humor here and there complete a readable and attractive story for beginning readers past the first stage. Verdict: Buy it! Every easy reader section should have at least some Toon books and this is definitely a must-have. It's easy to neglect nonfiction in your easy reader section and this is a nice blend of story and fact. We've got two copies, since I won a complete set of Toon Books to add to the ones I already bought! 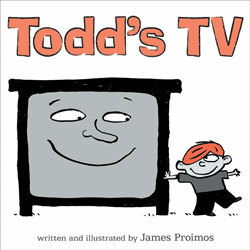 So, funny story, weird but cool art, and of course we like the message - parents, don't let the tv raise your child. But...the reservation I have about stories like this (and all the "we love libraries" "we love reading" etc. stories as well) is, well, who is the audience? If you're checking this book out of the library....you're probably not the kind of parent leaving your child to be raised by the tv. If you are that kind of parent, why would you read this book? I suppose it could be a funny reminder, but it seems to me that the parents likely to check this out will just get a guilt trip out of it - are we letting our kids watch too much tv? etc. Verdict: Unbought for philosophical reasons as stated above. I'm willing to be convinced otherwise though. Snow leopards are fascinating, beautiful, intriguing animals. Unfortunately, this book is none of those things. I have long had a private (ok, well, not so private) dislike of Pebble's offerings of nonfiction. Basically, they're not enough bang for the buck. Expensive, library bound editions should have something worth binding, in my opinion. This book is part of the Pebble Wildcats series. 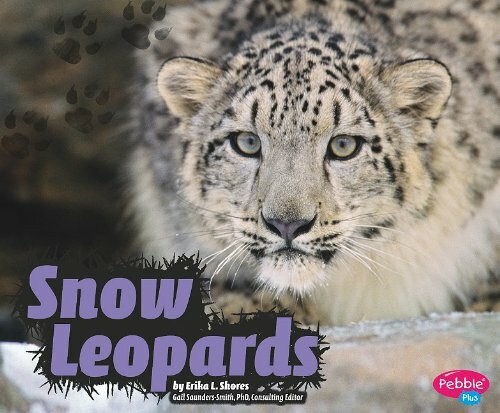 Twenty-four pages give simple facts about snow leopards accompanied by large photographs of snow leopards running, with babies, in the snow, and looking broodingly handsome, which snow leopards do very well. The text is stilted and awkward, obviously straining to conform to "national science standards related to life sciences" as well as specific vocabulary and reading level requirements. A sample of the text says, "At around 20 months, young leopards leave their mothers. Adult cats live alone. They use claw marks and smells to mark their ranges." I would assume that the author was handed a list of vocabulary words and reading levels and told to make sure the text fit. The photographs are detailed, and there really isn't such a thing as a "bad" photograph of a snow leopard (the whole broodingly handsome thing) but I found it increasingly annoying that there was no information given on where the photographs were taken. 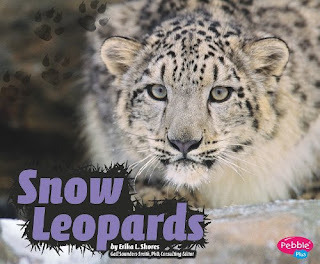 Considering how endangered and difficult to see snow leopards are, I would guess most of these photographs were taken in zoos, but although there is a list of photo credits, no further information is given. For an easy reader, this text is acceptable. But, as a librarian with a small budget, I object to paying $20 for an easy reader with such limited, bland text and obvious stock photography. I will wait for a book that appeals to a wider variety of ages and reading levels. Verdict: Save your money. Buy Sy Montgomery's Saving the Ghost of the Mountain for your older readers and join me in waiting for a better snow leopard book for younger readers and listeners. Anyone have suggestions? This week at the library; or, Comics and the most horrible of weeks!! Crazy, crazy morning on the desk, gazillions of phone calls, poor circulation staff had a huge number of bins, crazy crazy crazy. I started off my Make it and Take it craft program by making a kid cry. I have been firmly enforcing the 6 and up age limit - the crafts are not designed for younger kids and it was turning into a preschool program where I was spending all my time helping the little ones. Last week I found out that the little boy I assumed was a rather young first grader was actually FOUR. I felt horrible telling him he couldn't come in until he was at least in kindergarten next year, especially since he's very independent and asks his big sister when he does need help. But I can't turn away the other kids who want to come in and then make one exception. He silently walked away, brimming over with tears. I felt awful. I made a quick run to Walmart to get more dishpans, which I'm using to organize our craft materials in the storyroom. I'm actually approaching a high state of organization, although the piles of miscellaneous junk all over the floor may not look like it. Our Wii console is definitely broken and I mailed it in for repair on Monday, so Wii gaming is cancelled until further notice. At least five boys showed up though and wandered around looking forlorn and carrying their extra games and controllers they brought to share. Sorry guys. However. Everything went nuts outside the community room where I was doing my craft. I had to speak very sternly once again to the tweens who persist in hanging out in a small lobby area - we can't hear or see them there and they completely block the entrance. They counter that it's the only place they don't get in trouble. I remind them that they won't get in trouble if they follow the rules. Several of them are very mad at us because we called all their parents in one huge marathon. They think being noisy isn't that big a deal. I think it is a big deal when they are noisy every day - not to mention all the other problems we have with them, plus why are 11 year olds at the library for hours after school? While I was racing in and out, I looked up and saw some kids misbehaving in the old teen area, which we are trying to repurpose as a study nook. Basically, after all the brouhaha had quieted down, a group of teens, mostly girls with a few boys, were behaving inappropriately with lollipops. Plastic wrappers were also involved. I leave it to your imagination to fill in the rest. In addition, they approached a little girl with their inappropriateness, and her mother was righteously incensed. Hordes of librarians! Teens flee! We were very busy all through this of course, and we only ended up getting one girl's name. Whose parents I then got to call. Yay. Remember our director is on vacation? While I was recovering at the desk that evening from this traumatic experience, a bunch of kids and parents showed up and I discovered that the forward-thinking teacher who had checked out all our biome books for her class project had neglected to tell me it wasn't just her class that was doing the project. Annoyance from all parties ensued. Then a parent wanted to know why I didn't have Lego Building Club much later in the afternoon than 3:30. I tried to give a diplomatic answer, refraining from explaining that with attendance averaging around 30 - 50 kids and their parents, I had no intention of changing the schedules of multiple staff and reorganizing programming and publicity just so his child could have a full hour or more of Lego building time. And I finished off the evening by kicking out a group of older teens who were yelling and swearing in our lobby. I signed us up to try out Junior Library Guild, but didn't watch the time and ended up with no lunch time. I also found out that the art and music programs in our school district are in jeopardy and dealt with crazy patrons (crazy is the nicest thing I can say about them). The tweens tried to hang out in the small lobby AGAIN and I nearly lost it, as it was I got very close to yelling. Argh! Felt slightly better when, acting on a tip-off via cell phone from a patron in the parking lot, I discovered two teens making out in a corner outside the building and kicked them off library property. Got up at 5:45am to take the train down to Chicago for C2E2, a big comics convention. I was overall disappointed and Sara-the-librarian and I only stayed for about 3 hours. There were a lot fewer vendors - almost no manga, which was specifically why I went, Boom! wasn't there, another reason we went, and it all seemed very sparse. Although there were plenty of I-haven't-climbed-out-of-my-mother's-basement-since-I-was-ten used comic vendors. I wanted a shower after visiting their booths. Yeesh. There were only two professional presentations, neither of which was relevant to us. We went and bought fancy chocolates, apples, and fresh herbs at French Market to make ourselves feel better. I went in to work early around 8:45 to try and make some sense of the very confusing mess of receipts I had collected yesterday - some of which were scribbled on bits of paper. Our five year old birthday party was pretty successful, considering I suddenly realized mid-Thursday that I hadn't planned anything. Our theme was trucks and we had an ambulance come for the kids to check out and they got a little safety lecture. They were very well-behaved (for five year olds) and the ladies who drove the ambulance and did the presentation were great with the kids. I brought out everything vaguely round or tube shaped I had in my storage closet and told the kids the challenge was to make a car - they went one better and came up with all sorts of crazy things, which was totally cool. I love little kid imaginations! We had shakers (made of paper towel tubes with big wooden beads inside), several fishing rods (paper towel tubes with ribbon spools attached and pipe cleaners for lines) and pipe cleaner flowers. Pattie brought a bunch of cut-out crafts - pinwheels and finger puppets and stuff, and we had almost 30 people. I went down to McHenry; one of my teens told me the Borders there was closing and had great deals on manga and she was right! I am still a long way from filling in our very scattered series, but I have used up most of my manga budget for this year and may even have a little left over, with all the money I saved. I do not understand how we ended up with such a scattered collection - very few consecutive numbers and not a single complete series of anything! But I am doing my best to remedy the problem. In a final fortuitous series of events, which made me feel much better about the whole week, among the last few cooking books unsold was the exact bread book I really wanted and when I made a wrong turn coming out of the shopping center and turned in at a gas station to turn around, I happened to glance at my gauge and realized it was almost empty. Phew! Or just read comics and eat caramel popcorn from the train station in Chicago. Weeks like these I want to wack over the head all the well meaning people who talk about how much fun my job must be and how easy. Yes, I love my job (mostly), yes, it's often fun, yes, sometimes it's even easy. But there's also a LOT of dealing with recalcitrant, annoying, bored, and mentally ill kids, teens, and adults. We're expected to constantly grow our circulation, programming, and patron numbers without additional staff to adequately supervise and serve said patrons. Mostly we rise to the challenge. Sometimes we just have crazy weeks.Good thing we got chocolates yesterday. Quite a few people have been getting excited about this book, and when I borrowed it from another library, I found myself getting excited also. There's such a wide and fascinating mixture of stories and art styles, there's sure to be something to interest every reader. Although some of the stories have odd turns of phrases or plot that will be confusing to anyone not familiar with that particular culture, there's not really anything most parents would find inappropriate for their children and I think this collection would fit comfortable into any age level - juvenile, teen, or adult. 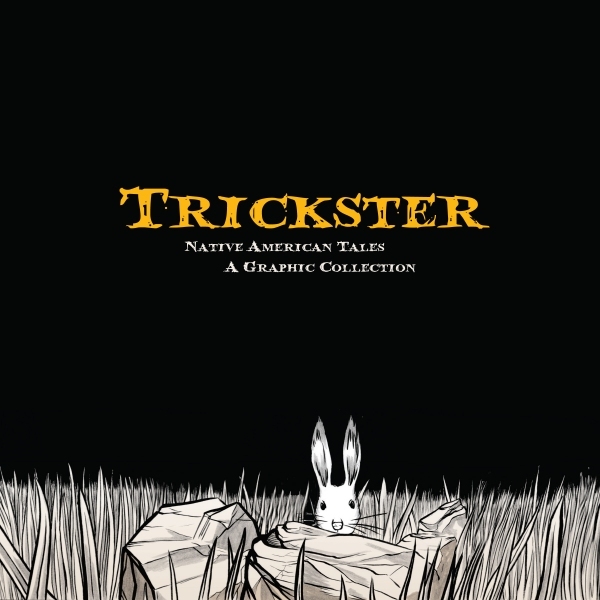 They're all trickster tales, of course, which tend to be the most accessible stories passing between different cultures, in my opinion. Some of my favorite selections in this book include...Azban and the crayfish by James and Joseph Bruchac, illustrated by Matt Dembicki, which tells the story of clever Azban the raccoon and how he tricks the crayfish into becoming his dinner, with realistic art and lots of verve and sly humor. Rabbit and the tug of war by Michael Thompson with art by Jacob Warrenfeltz - I had thought this particular story was African, and I was interested to see it in a different setting, with lots of grays and browns in the artwork. Rabbit's Choctaw Tail Tale by Tim Tingle, illustrated by Pat Lewis is told in a very corny way with lots of silly, cartoonish illustrations that would make a hilarious read-aloud or a good short puppet play. I liked the glowing colors and clever story of The Wolf and the Mink by Elaine Grinnell, art by Michelle Silva. There's a complete list of contents, note from the editor (Matt Dembicki) explaining how the collection came to be, and a detailed list of contributors. You'll have to read carefully through the contributor list to match up the tales with their various origins, or you can just read and enjoy. Of course, the binding looks doubtful, as about 90% of paperback graphic novel bindings do, but at least there's plenty of gutter so you can rebind and glue when it falls apart. Verdict: A definite recommendation for any graphic novel collection - or for your 398's, if you don't have a gn collection yet. I would put it in a middle grade or juvenile collection, but it would work fine in teen or adult as well. A little button-eyed boy is reading a book about birds. He dreams of flying and finally takes his question to the ultimate source: Dad. "why can't I fly?" he asks. In a series of silly questions and answers, Papa explains why people can't fly - usually! The exuberant interaction between father and son is perfectly created. Anyone who's ever tried to answer a child's unanswerable questions will giggle over Papa's delightful solution and physical illustrations of his answers. The illustrations feature the two main characters on blank colored backgrounds with their dreams of flying set encased in wildly colored balloons. My only quibble is the final flying dream sequence goes on for too long and is liable to lose the attention of toddlers. But you can easily skip to the punchline at the end. Verdict: We need more dad books! An excellent addition to a library collection. ISBN: 978-1561454303; Published March 2009 by Peachtree; Borrowed from the library. While I am firmly against picture book biographies, no matter how intriguing, I am firmly FOR readable picture book nonfiction, specifically picture book nonfiction that begs to be read aloud! This lovely new book about propagation is a perfect example of what I look for in read aloud nonfiction. In simple language, Galbraith explains how seeds are planted in the wild. She describes several ways seeds are spread and planted, including wind, birds, self-propelling seeds, rain, streams, animals such as rabbits and foxes, and people. The story of how seeds are spread and planted moves briskly with text that is easily understandable by very young children and will also interest older listeners. Wendy Halperin's illustrations are the perfect accompaniment to Galbraith's text. Soft colors and delicately detailed botanical drawings are beautifully arranged in a series of panels of various sizes. The large panels of the illustrations give an overall view of the area described while the smaller panels show the movement of the seeds in detail. Verdict: This is a lovely book - beautifully written and beautifully illustrated. An excellent choice for preschool storytime and nature talks with older children. Highly recommended for every library collection. This week at the library; or, I brave the terrors of high school! Is it just me, or is there more to do every day? We made no sew yarn creatures for Make it and Take it, borrowed from The Imaginary Librarian. It sort of worked. I was working with younger kids, mostly 7 and 8 year olds, and they weren't very patient. Plus, the project had looked so easy I hadn't really tested it and after some frustration I went back and looked at it again and realized we needed to wrap a LOT more yarn than we were, especially because it kept slipping off the fins. Um, fins, well, I had gingerbread shaped die cuts from cardboard, but I had some giant fish too, so...anyways, the kids got more into it and it was fun in the end. I spent Tuesday morning at the high school, doing a presentation on the delights of being a librarian and selecting books and reading aloud to babies up through early grades. This was for Child Development classes and the first one wasn't very interested. Probably because they were mostly asleep. The second class was a little more lively, but I emphasized that one of the advantages of being a public librarian was not having to get up at an unearthly hour in the morning. High school around here starts around 7 or 7:30. Yech. I wasn't at work in the afternoon, having gone to Chicago, but it turns out that it wasn't the wrong cords for the Wii. The Wii is dead. It got knocked over a couple weeks ago and that finished it off. So, no more gaming until it gets repaired. I made a giant shopping trip to Walmart and bought $500 worth of blu-ray and Wii games for circulation, despite the fact that I am personally convinced that blu-ray=betamax. However, we were putting a press release in the paper on Thursday saying we had blu-ray and we had...Beauty and the Beast on blu-ray, so I had to get some more. We only had 26 at Lego Building Club, down from 51 at our last meeting. However, the weather was icky and we had snow, so that's probably why. We had a pretty good group for preschool storytime. Our theme was guinea pigs and we read Clarice Bean Guess Who's Babysitting, Guinea Pigs Add Up, and Twenty is too many. We did some very intense counting. I had planned to do something with fur scraps, but had forgotten to get the fur, so we went for fingerpaint and everyone had fun, even if a few parents were a little worried about the mess factor. It's washable folks! Small children are supposed to be messy! 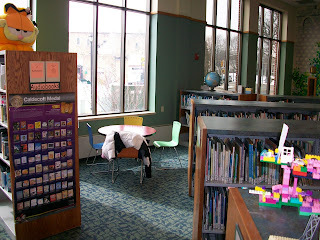 Our tween area is still under construction - I had a bunch of the kids decorate new die cuts for the windows. Much fun was had by all and only a small amount of glue was smeared about. I worked a half day on Friday, starting with an exciting staff meeting and then I worked Saturday. Nothing of great note happened, other than another beleaguered parent suffering from a severe case of lexilitis. I love R. W. Alley's illustrations, so classic and yet so funny. It's a perennial woe to me that no one will check out Wolf's at the door. Too big. Sigh. This one, though, will fly off the shelf! A little boy is trying to read. But that annoying tiger just can't be quiet! 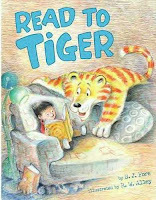 First he chomps, then he growls...and "it's very hard to read when there's a Karate Tiger behind your couch..."
Finally, Tiger settles down and discovers just what it is that the little boy finds so entrancing about his book and joins in the fun. The tiger's exuberant stripiness stands out again the couch and it's accessories and the expressions on the little boy and tiger's faces are hilarious. A perfect bedtime story for wandering and rambunctious little ones as well as a fun story for older kids to sympathize with the little boy. 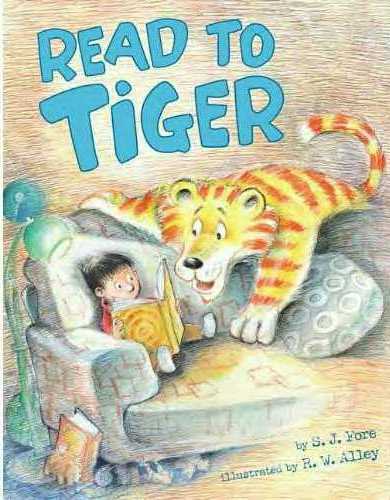 Verdict: Recommended for story times about reading and tigers! ISBN: 978-0670011407; Published August 2010 by Viking; Borrowed from the library. Olivia is desperate and miserable. Her mother died during the winter and there's no one but her to look after and understand five-year-old Nellie. Especially now that Pop is sending them to stay with Aunt Minty. She's old and doesn't really want them - and she certainly doesn't understand Nellie's Rules, which must be followed. Aunt Minty makes some well-intentioned but disastrous attempts to help Olivia and Nellie, but their healing doesn't really begin until Olivia finds an old book and they set out on a marvelous treasure hunt. Could the magical story of the Lost Flower Children be true? Nellie absolutely believes, but Olivia knows she's too old for magic. But maybe a little magic is just what she needs. This story doesn't have the wrenching emotional pain of some of the contemporary middle grade books about death, such as Suzanne LaFleur's Love, Aubrey or Sally Nicholls' Ways to Live Forever, but Olivia and Nellie's grief and struggle to adjust after their mother's death is very real. Their characters are beautifully drawn and open to the reader throughout the story as we watch them grow, change, and create a new family dynamic. Like the garden, Olivia and Nellie come back to life slowly. It takes a lot of work and weeding from everyone, but the result is beautiful. 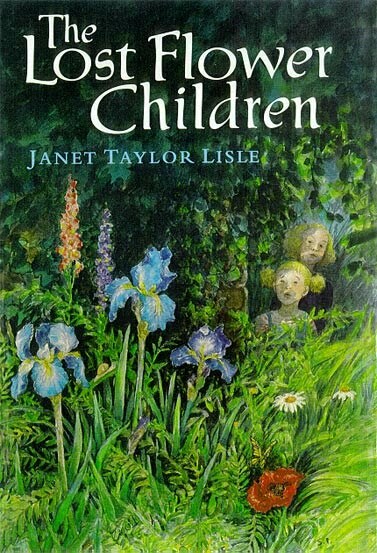 Verdict: I've read several Janet Taylor Lisle novels and found them compelling, although not what I'd normally read. I picked this one up because the cover and interior illustrations are done by Satomi Ichikawa, whom I love for her illustrations of Patricia Lee Gauch's Tanya ballet picture books. I also love anything Ichikawa does involving gardens, so this was a lovely book. Worth adding to your library, even as a paperback. 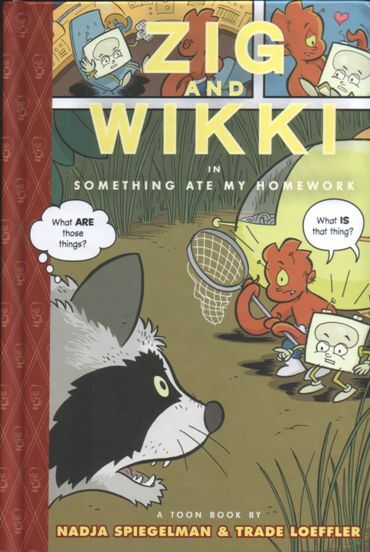 ISBN:978-0698118805; Published April 2001 by Philomel (out of print); Received through Bookmooch. This is what the area originally looked like...it's hard to see, but on the other side of the Garfield shelf is a couple tables and chairs and a magazine shelf. The edge of the chair you see is the small table and chair set that was right next to the Garfield shelf. and a much bigger space for tweens here. One of the doors at the end is a restroom, the other is our maintenance closet. We just have one big beanbag, which I brought down from the young adult area, but I've ordered three smaller bean bags and I'm hoping we'll have enough money in the budget to get another table and chairs set. The kids are painting small hot air balloons to hang from the ceiling and helping me take down the snowflakes so we can decorate the windows for spring! I'm also hoping to have a small computer lab here someday - just four standing stations - and maybe some small chalkboards or dry erase boards the kids can draw on. But we're starting simple! I don't often look at books with movable parts or other oddities, but this one is so interesting I wanted to share it. Six spreads present flaps of different parts of animals. The first spread has four white on black silhouettes of animal heads and you have to guess what animal it is before lifting the flap and seeing a color drawing of the animal and an interesting fact. The second spread shows four more silhouettes, this time black on white, of humps and horns. Again, guess the animal and lift the flap - but this time the drawn animals are much larger, opening out as you open the flap, with an interesting fact about the body part in silhouette. The third spread has ten flaps of varying sizes showing patterns on animal skins. Underneath each of these is a pop-out animal. Some of the facts are related to the animal's skin, while some are just general. The fourth spread has black flaps with a small cut out circle revealing the animal's nose, while their feet stick out below. The fifth spread has the same partial covering, this time with a circle that shows the animal's eye, while its tail sticks out from the flap. The fifth spread shows ears and the sixth spread has a wide variety of animal tracks to identify. The book itself is definitely oversize, about a foot wide and 16" tall. It looks to me like the binding is just stapled perhaps? So it might easily come apart. But it's an utterly fascinating book! Even in just the few pages and flaps, there is an astonishing variety of animals and chances to guess their identities. 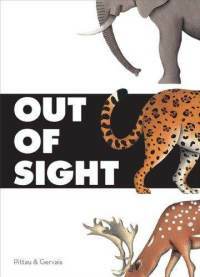 I can see a lot more uses for this book as well, looking at the ways the animals in the various groupings are the same and different, finding other animals with similar patterns or attributes, creating your own flap pictures or books, etc. Verdict: This would probably be better as a gift for an individual child than a purchase for a library, but if you have any kind of movable book collection, definitely consider it. It's a lot easier to reinforce than some pop-ups and lift-the-flap books - the library I borrowed it from easily covered the flaps with some kind of clear contact paper or laminate. ISBN: 9780811877121; Published in the US November 2010 by Chronicle (translated from the French); Borrowed from the library. Another week, and even more publicity...it never ends. I might as well be in marketing and PR. Make it and Take it - I had a lot of Twisteez wire left over from another project last year, so I handed it off to the kids. They were supposed to make butterflies and other winged insects (I had tissue paper for the wings) but as always when I hand out anything twistable, it gets twisted! Seven and eight year old girls seem to be the age at which they learn to braid and they are fascinated with this new skill. We ended up with quite a lot of fantastic creations, check out some pictures here. Then I stayed late to finish putting together publicity packets for the schools. See what I mean? Thanks to me accidentally sending the cords off with our laptop to a meeting, Wii did not happen. However, I had 6 kids at book club! SIX!! We had quite the argument over the ARCs I brought to share, especially Squish: Super Amoeba. My view of the day was slightly colored by forgetting to eat anything but a cheese sandwich. Very hungry! However, we had an excellent group at Messy Art Club doing fingerpaint and it wasn't even that messy. I had the last-minute inspiration to use some of the overstock of tongue depressors I bought to scoop out the fingerpaint, which always glops too much and it worked great. We tested out some of our new fingerpaint from Discount School Supply and it's absolutely lovely. I had a whopper group at Preschool Storytime, nearly twenty! We did a fish storytime, starting with Swimmy by Leo Lionni, then we read Swim Swim by James Proimos (Lerch) with swimming up and down motions with our hands. This one really touched a chord with the parents, who were all choking with laughter while the kids solemnly "swam" their hands up and down. Then we read I'm the biggest thing in the ocean by Kevin Sherry, with the kids naming the creatures that the squid is bigger than, we did "the animals in the ocean" to the tune of "the wheels on the bus" and finished up with Does a sea cow say moo? by Terry Harshman. The older kids liked this one, but the younger kids were getting wiggly. We used bleeding art tissue to "paint" cardboard fish, always a favorite project. Three girls came in to start painting the hot air balloons for our tween area - they're going to hang from the ceiling at various points. They had fun and were very well-behaved! Friday just sort of happened. I only worked a half day because I'm going to the Family Resource Fair on Saturday. Our county Family Resource Fair was well-attended. I actually got the laptop and our ILS to work offsite this time, so I could distribute library cards, but I didn't find anyone who didn't already have one, which is good! Gave out some flyers, talked about programs, chatted with some neighboring librarians (they put us all together in a row) the one everyone was interested in was Lego Building Club, although I did give out some book club flyers and a couple parents were interested in our lapsit (baby) storytime. It was a long, hungry day from 8:45 when I started scraping snow off my car to 2pm when I scooped up all my stuff (and extras from librarians who had to leave or couldn't make it) and left to meet Sara-the-librarian for lunch and sticker hunting at the craft store. Phew! 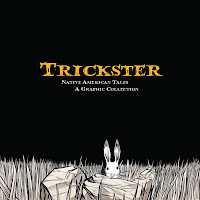 I've been seeing lots of good press for this graphic novel, so I was pleased when I got a chance to look at it. I really enjoyed it, but I'm not sure how well it would circulate in my library. Evelyn Weiss is a lonely, neglected girl, sent to live with her bohemian aunt in New York while her father marries yet another wife. She consoles herself and passes the time by drawing comics about Zirconium Man and his sidekick Snapper, adventures she puts herself and her father into. When she makes friends with Tony, the building supervisor's son, they find themselves in the middle of a real adventure! There's plenty of development in all the characters, as well as exciting action, codes, and history. Tony has misconceptions and prejudices against "rich girls" like Evelyn and her selfish, spoiled Aunt Lia. Lia gets a dose of reality and finally starts growing up when she has to take responsibility for Evelyn and think about someone else. Evelyn learns to think more about the consequences of her actions and get involved in the real world, instead of hiding in her daydreams. 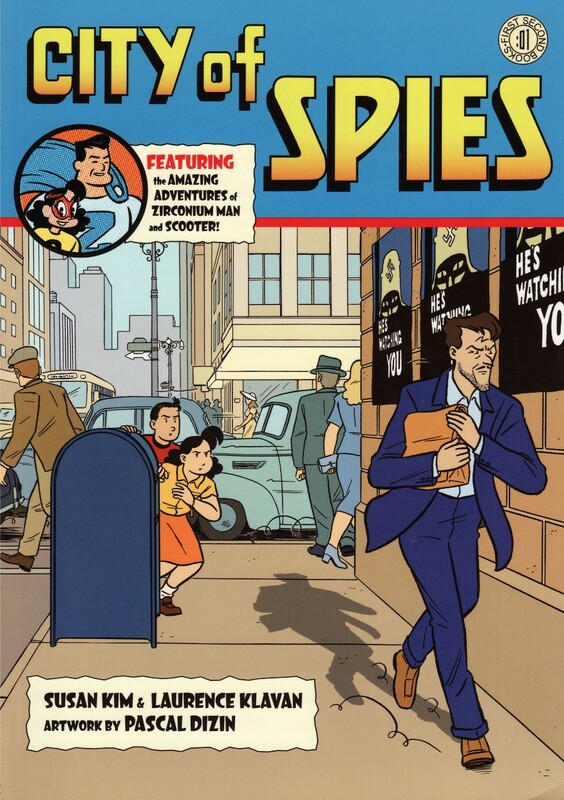 The spy plot is good, not cliched or exaggerated. The fear and worry of subversive agents is perfectly captured, as well as the prejudices and concerns of the time. Several reviewers have commented on the Herge-like quality of the art and it certainly has a Tintinish air. The text is readable, but there's plenty of action and plot crammed into every page. But....I'm still not sure how many kids will want to read this. Will they know enough history to fit the story into its context? Will Evelyn's Zirconium Man daydreams put them off? I haven't yet met any younger kids (or older ones for that matter) who like the old, classic comic styles. On the other hand, we don't have many plain adventure comics, so maybe this would fill a niche....What do you think? Do you have readers who liked this one? ISBN: 978-1596432628; Published April 2010 by First Second; Borrowed from the library.